What would an ‘Internet of Things’ device need to prove to ensure your basic rights and personal safety are not compromised? Privacy-invading guff blobs, also known as ‘smart’ devices are big business. It feels like every conceivable inanimate object now has an internet connection. You can turn your oven on and off with your phone when you’re out! Who needs a key when you can have an ultra-safe serial pad to open your front door? Your toilet can give you nutritional advice based on your extractions. You may have noticed that I happen to believe the ‘Internet of Things’ is a jumped up nonsense term for personal surveillance technology, turning your life into that of a Stasi subject of interest while masquerading as an exciting life-changing innovation. It will change your life alright but not in the ways you expect. There is a heavy cost associated with the honour of being able to change your Spotify playlist with your voice while baking a cake. You have turned your home, your sanctuary for you and those you care about most, into a profit-making panopticon for companies who have no respect for your human dignity and don’t believe that a wider society even exists. In her recent book, The New Age of Surveillance Capitalism (possibly the most important book written about the internet so far) Shoshana Zuboff refers to an old piece of research called the Aware Home. This was an early ‘smart’ home experiment set up by students of Georgia Tech University. One floor of a house was kitted out with floor sensors and other movement tracking technology. The basic premise was to see how the technology might be used to help make life slightly easier for elderly occupants. Doors can open ahead of them being reached and health data can be monitored to call for a doctor or family member if needed. The home is constantly monitoring the occupants’ whereabouts and activities, using audio and video observation methods, and even tracking its inhabitants’ medical conditions. There is a clear need to give the occupants knowledge and control of the distribution of this information. This is a concern that we expect to become more prominent as we develop the systems that will be collecting various types of sensitive information. One method that we may use for ensuring the privacy of an individual’s information is to store personal information on a wearable computer and allowing access to be controlled from there. Other programmatic security mechanisms are the direct concern of distributed computing researchers involved in the project. In today’s context of product development and speed to market (move fast and break things) it seems almost impossible that someone would actually stop to consider the possible negative consequences of what they’re doing and think about countermeasures to minimise risk. It’s even more inconceivable big tech firms like Google and Facebook would even care. The Georgia Tech researchers were writing in a period before surveillance became a mainstream internet narrative and decided that the best thing for the Aware Home was to operate as a closed loop, with the occupants able to have full control around what data is created and how it’s used. 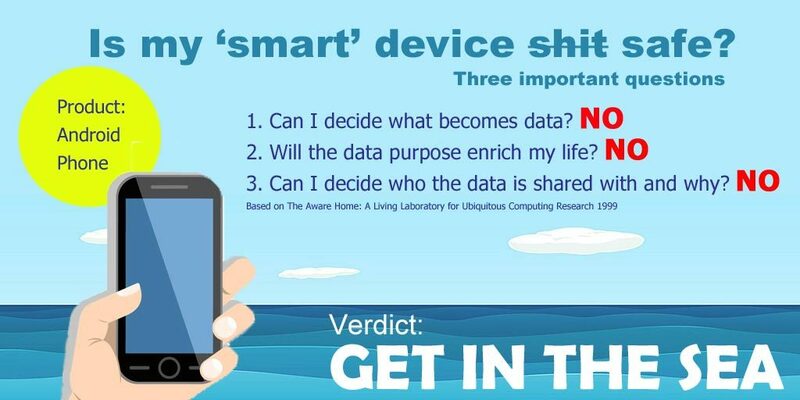 Sharing the data with people and organisations outside the home was not the default it’s today. These three considerations which protect the sovereignty and safety of the occupants, should form the design foundations for any ‘smart’ devices. If the device is unable to meet these three conditions then it should not be used – indeed I would argue that you should not allow it in your home in the first place. A surveillance device that you can’t control or have any meaningful consent over its operation is an affront to you as a consumer and as a person. As Stuart Lee says any such device should “Get in the sea”. How would many of the most popular ‘smart’ devices fair against the three Aware Home considerations? Let’s see. Poverty wage employer Amazon claims to have sold over 100 million of these worldwide. That’s 100 million homes wiretapped by Jeff Bezos, the world’s biggest fauxlanthropist. These wonderful little security packages are sent to you via your cuddly surveillance capitalists at Google. What could possibly go wrong? It’s just a vacuum cleaner. What could be more benign than that? Just don’t let your dog go on the floor before you use it. 85% of the world’s phones use Android and there’s probably an Android phone in your house even if it isn’t yours. Plus you get to take it with you everywhere you go as an added bonus. You can now see that ‘smart’ is indeed a euphemism for surveillance. ‘Smart’ means having your own decisions removed. You will eat what you’re given and be grateful for it because these devices are not designed and built for the likes of you. 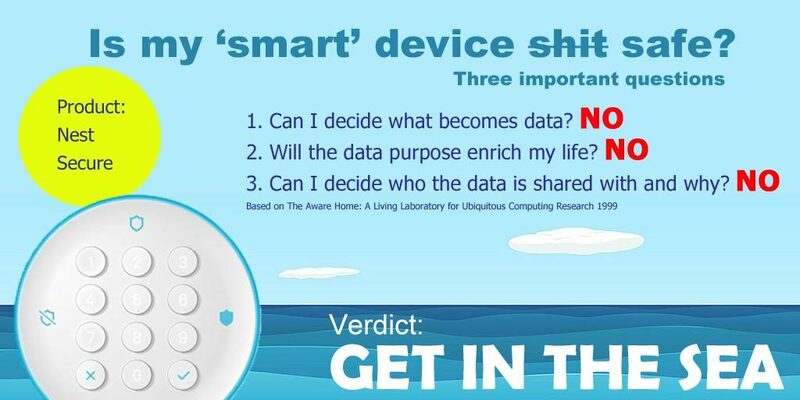 There are very few ‘smart’ devices that could meet even one of these conditions let along three. You can always avoid buying these devices in the first place, can’t you? This is of little comfort to some renters who are having this ‘smart’ technology forced upon by landlords – something reminiscent of a JG Ballard novel. For those people, who often have to connect the ‘smart’ tech through their own personal internet connection, they are given a choice of accepting the 24/7 surveillance of their landlords and various data extraction companies or to move out. For many, due to lease clauses or other financial restraints, they feel trapped and without a choice. Your landlord turns your apartment into a smart home. Now what? There is a large amount of research that shows when people are aware of how surveillance is used to extract data then they become less willing to participate in facilitating the extraction. 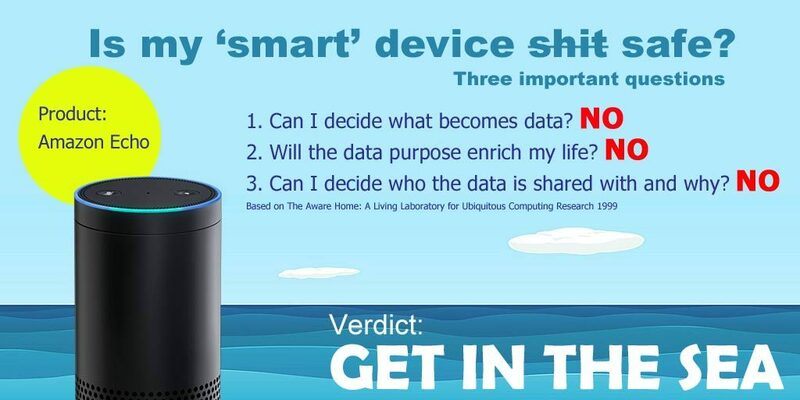 If a clear choice is given to provide a whole host of behavioural and personal data which is not even relevant to the function of the device then most people will say ‘no’. This is why impossibly long and confusing terms and conditions, UX dark patterns and misdirection are so commonplace to avoid offering any meaningful consent. It’s commonplace in some ‘smart’ devices to offer another Hobson’s choice the first time you try to use it. Accept all our terms and conditions and those of our partners (now and in the future) or we will restrict the functionality of the device significantly for it to be almost unusable. This is blackmail not consent. The restriction of functionality is not justified in any meaningful way. Your robotic vacuum will still work if you choose not to allow Google to have a map of the inside of your house. But no, we won’t let you do that. Having spent your own money to buy the device you are then held to ransom before you’ve even had a chance to use it for the first time. Smart talking: are our devices threatening our privacy? These are our homes, our sanctuary, the one place where we should be able to relax and feel safe, where we spend time with the people most important to us. The place we can fart and burp and scratch our bits without being judged. It’s essential to us as human beings to have this private space. These companies seek to seize the one part of our lives which shouldn’t be bought and sold and claim it as their own. 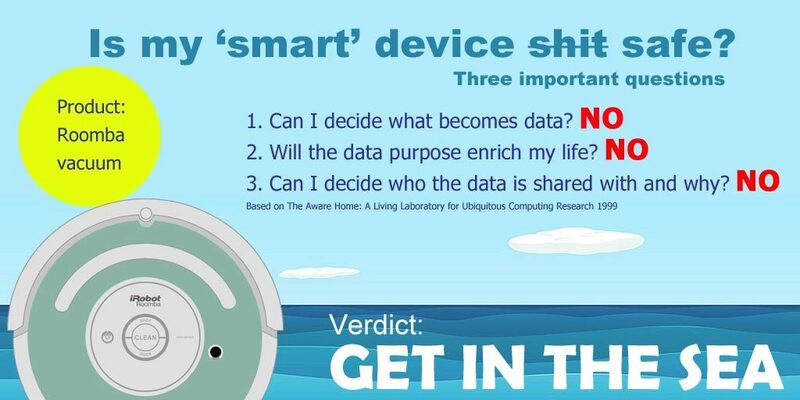 These three conditions applied as questions are a useful tool to understand and assess ‘smart’ devices and any other surveillance capitalist created technology. We need to remodel the present to embrace privacy first technology which is built responsibly, for us and not about us. If we get it right now the future will take care of itself. I write about the web and digital, mediocre sporting performances and places I've been, for this blog and only this blog. How much longer can your brand stay on Facebook? © 2019 James Mullarkey. All rights reserved.